Araucariaceae Henkel & Hoch. Synopsis der Nädelholzer 17: 1. (1865) nom. cons. Dammaraceae Link, Abh. Königl. Akad. Wiss. Berlin, 1827: 157. (1830) nom. illeg. Kunzmann, L. 2007. Araucariaceae (Pinopsida): aspects in palaeobiogeography and palaeobiodiversity in the Mesozoic. Zoologischer Anzeiger 246: 257–277. The Plant List 2013. Araucariaceae in The Plant List Version 1.1. Published on the internet. Accessed: 2014 Feb. 2. Tropicos.org 2014. Araucariaceae . Missouri Botanical Garden. Published on the internet. Accessed: 2014 Feb. 2. Flora of Australia Volume 48 (1998). 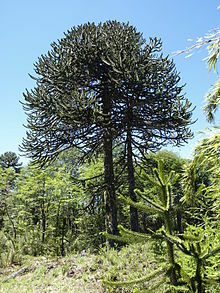 For more multimedia, look at Araucariaceae on Wikimedia Commons.